Every year on September 24, the Greek Orthodox Church commemorates the icon of Panagia Myrtidiotissa which was found on Kythera in the 14th century. 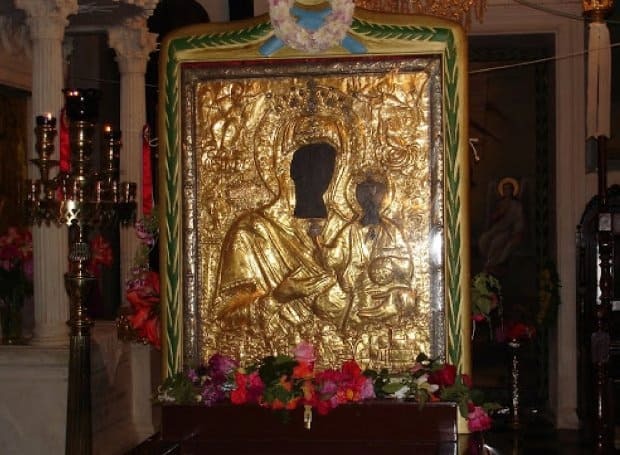 “The Icon of the Most Holy Theotokos Of the Myrtle Tree” (Myrtidiotissa) is now in the monastery church of Myrtides on the island of Kythera. It derives its name from the fact that it was found in a myrtle bush in the fourteenth century. When he woke up the next morning, the shepherd found the icon missing, and thought that perhaps someone had stolen it during the night. With a heavy heart, he led his sheep back to the spot where he had found the icon. To his amazement, he saw the icon once again in the branches of the myrtle bush. Glorifying God, the man took the icon home with him once more. The next morning, it had disappeared just as it had before. When this happened a third time, the shepherd realised that the Mother of God wanted her icon to remain where it had first appeared. A small church was built to house the icon, and was called “Of the Myrtle Tree,” after the icon. The building was replaced and enlarged over the years, and many miracles took place there. 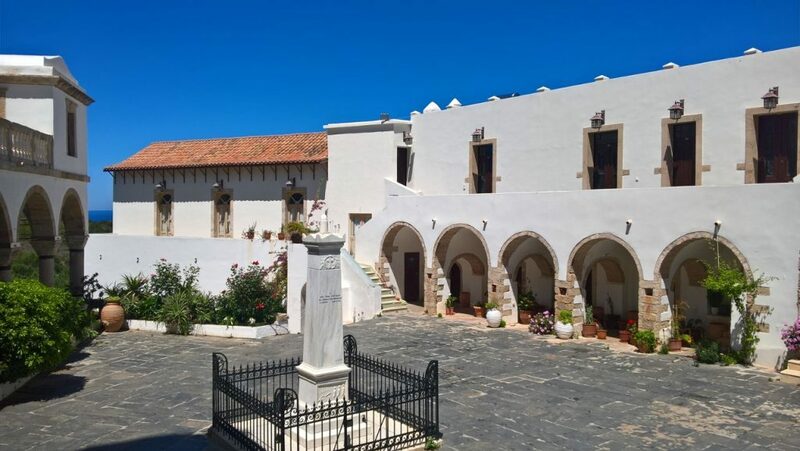 At the end of the sixteenth century Theodore Koumprianos, a descendant of the shepherd who found the icon lived in the village of Kousoumari. He was a paralytic and had an unshakeable faith that the Mother of God would heal him. Each year on September 24 he sent a family member to the church to light candles for him. One year he asked to be carried there by his family so that he might venerate the icon himself. During the Vigil, a great noise was heard coming from the direction of the sea. People fled the church, thinking that pirates were attacking. The paralytic remained in the church by himself, entreating the Mother of God for protection. Suddenly, he heard a voice from the icon telling him to get up and flee. He stood up, and then walked out of the church. Soon he was able to run and catch up with his relatives, who rejoiced upon seeing this miracle. As it turned out, there was no pirate attack, and the noise was regarded as a sign of God’s providence so that the paralytic could remain alone in church with the icon. Since that time the Koumprianos family has celebrated the icon’s Feast Day with a special reverence since Theodore had been healed on that day. Some of the other miracles associated with the Most Holy Theotokos and her icon “Of the Myrtle Tree” include protection of the island from the plague, ending the barrenness of a Jewish woman from Alexandria, saving people from death, and many other great wonders. Pilgrims come to venerate the icon on the Feast of the Dormition (August 15), and also on the day of its discovery, today September 24, which is also the name day for Myrsinni, Myrto and Thekla. Greek man Babis Bizas, the "most travelled person in the world"